Currently viewing the category: "Highway Department"
Did You Know? – An AARP Smart Driver Course will be held on.. Since 1985 the Downers Grove Township has been the caretaker of Oak Hill/Oak Crest Cemeteries. Oak Hill and Oak Crest cemeteries are located between Maple Avenue and Howard Street, in unincorporated Downers Grove, and Lisle Township. Founded in 1946 and with a current staff of 3350, one of the country’s premier research labs, Argonne National Laboratories, is in Downers Grove Township. Downers Grove Township employs Human Services staff and a Case Worker who can provide information, resources, assistance (if qualified), connections, collaborations and education for youth and help for seniors. For more information on our programs, visit our website at www.dgtownship.com or call us at (630) 719.6610. Did You Know? – Teens who do not participate in after school…. There are seven primary villages within Downers Grove Township: Burr Ridge, Clarendon Hills, Darien, Downers Grove, Hinsdale, Westmont and Willowbrook. As of the 2010 U.S. Census, the population was 146,795 and it contained 60,438 housing units. In 2016 there were a total of 58,557 parcels in Downers Grove Township. 57,321 were locally assessed parcels and 1,236 were non-homestead exemption parcels. If you have questions, you can contact our Assessor’s Office at (630) 719-6630. 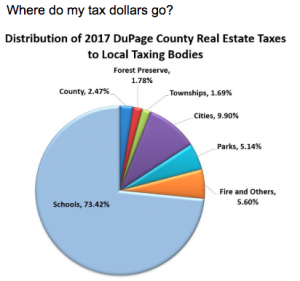 The DuPage County Treasurer’s website has a section that allows you to print a duplicate tax bill by providing the parcel number of your property. Visit their website at: www.dupageco.org/treasurer and click on “Duplicate Tax Bill”.